Having earned my air traffic control licence at Penticton (YYF) tower in 1989, I was thrilled to be awarded a full-time position there when Castlegar (YCG) tower closed in 1990. I already knew and liked all the airport staff and loved what I’d seen of the area in the few short months I’d spent training there. Nestled between Okanagan and Skaha Lakes with a semi-arid climate (HOT dry summers / moderately cool winters), and low population numbers (27,000 in 1990), I found Penticton to be a little bit of heaven on earth. With a schedule of 5 on / 4 off, I continued to do what I’d done since arriving in British Columbia in 1988 – which was to tour the area every chance I had. I soon had a great appreciation for all of southern British Columbia, Washington and western Oregon. When thinking of a place to live, one place stuck out in my mind, however, and that was Vaseux Lake. Situated only 20 minutes south of Penticton, Vaseux Lake is 2.361 miles (3.8 km) long, 2,625 feet (800 m) wide, with a maximum depth of 27 m (81 ft). It has a California bighorn sheep habitat sanctuary on the east side, a national waterfowl sanctuary on the west side and is non-motorized, ie. UBER-peaceful. 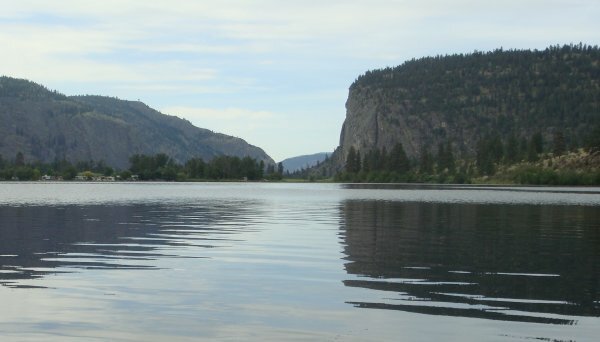 Ten minutes north of the lake is the small town of Okanagan Falls (pop. 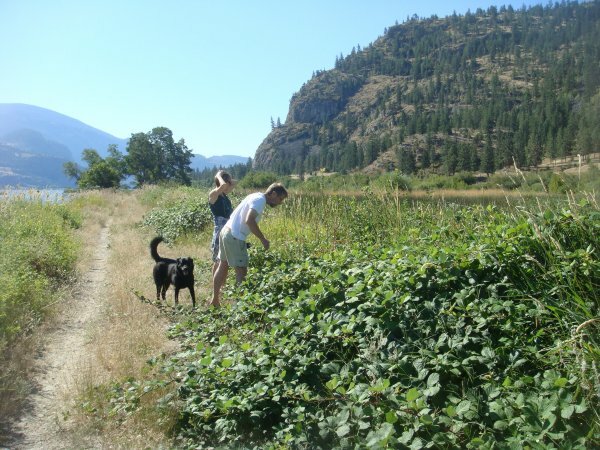 2500) located on the shore of Skaha Lake and 10 minutes south of the lake is the town of Oliver (pop. 4500), known as the ‘wine capital of Canada’. The owners called me the day after I looked at the cabin, telling me that they’d had an offer for the full 150K, but that they would rather sell it to me, if I could match the offer. I couldn’t (or didn’t have the smarts to seek funding elsewhere) and let it go. Since then, EVERY time I drove by that road – even when I was residing elsewhere – I stopped by Sundial Road to see what was for sale. In the meantime, I hiked, canoed and kayaked at the lake whenever possible. 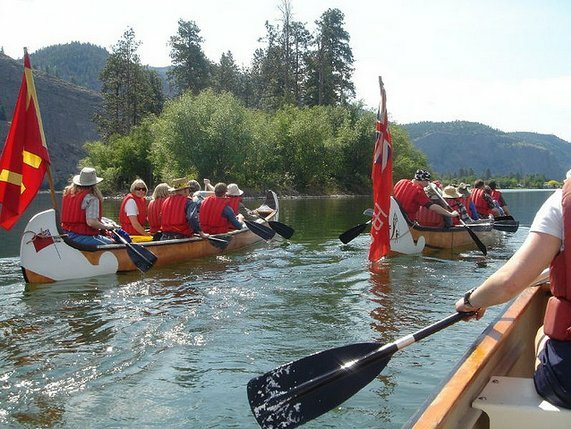 Voyageur canoeing with my friend Pam during the Meadowlark Festival in 2005. 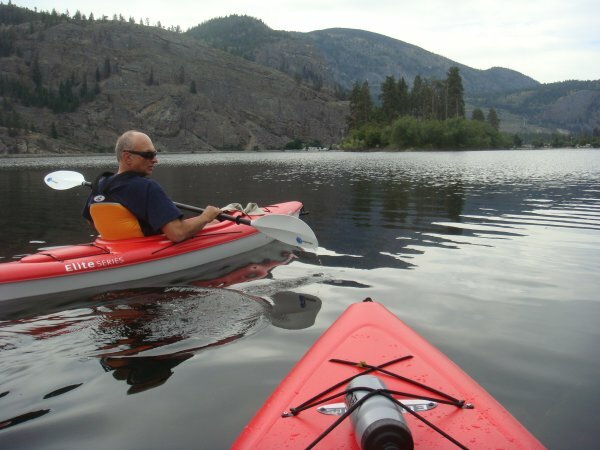 The first time we used our new kayaks was on Vaseux Lake.